How Far is Shubh Villa? After the immense success of Shubh Villa Phase – I, Shubh Nivesh Realtors has launched its Phase – II of “Shubh Villa” these luxurious villas are full of ultra luxurious amentines such as Club House, Kids Play Area, School, Parks etc. These villas are located adjacent to Tech – Zone on Yamuna Expressway. These Villas are developed in fully gated community with the sizes of sizes are almost sold – out i .e. 1410 sqft and 1750 sqft. 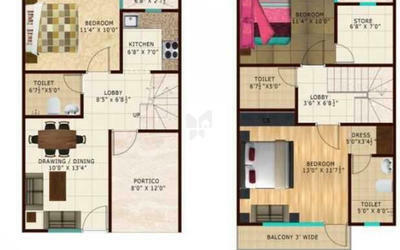 Phase – II, Size 1800 Sq.Ft. 3 BHK + Study Room + Persona Lawn,This society located at very good connectivity and surrounded by the corporate and I.T.parks. There is three fully – functional universities in the radius of 1.5 kms. In the vicinity of Shubh Villa is proposed Night Safari, under construction Cricket Stadium and many running schools, Formula One Race track, petrol/CNG pump are fully – functional. Shubh Villa is an ultimate reflection of the urban chic lifestyle located in Yamuna Expressway, GreaterNoida. The project hosts in its lap exclusively designed Residential Villas, each being an epitome of elegance and simplicity.